... 1885 (125 years ago today), Sigrid Hjertén (left) was born in Sundsvall, Sweden. 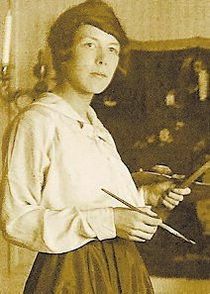 Following university studies in the teaching of art, Hjertén, then in her mid-20s, met an art student (her future husband) who persuaded her that she had a future in painting. The 2 subsequently studied with Henri Matisse in Paris. Hjertén painted for 3 decades and "is considered a major figure in Swedish modernism." 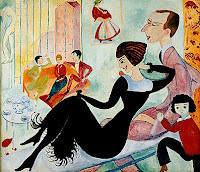 (credit for 1916 painting by her, at right) Her career ended when, suffering from schizophrenia, she was lobotomized. Hjertén died in Stockholm in 1948, at age 62.